The 2 great rules for customising denim are AGE and EMBELLISH. Embroidered denim everywhere at the moment but I thought I’d make my own. 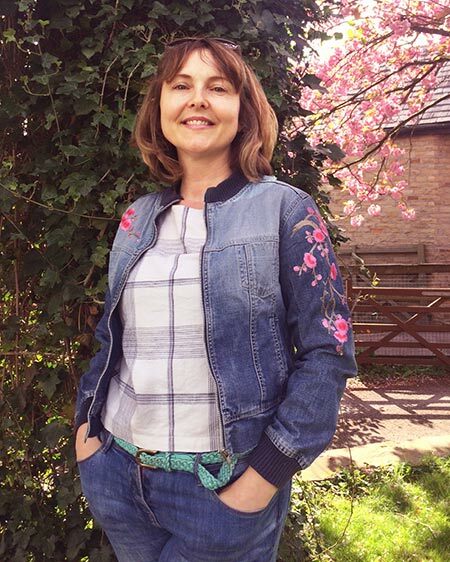 This denim bomber jacket (RIGHT) is one I bought for just a couple of pounds from Ebay and then added on these gorgeous iron-on blossom appliqués. How simple! Here is the link to buy the appliqué – they come in lots of different colours. If you are feeling braver and more creative than taking the easy option that I took, then try doing your own by hand. You only need a few embroidery threads and a good needle. Draw out your design onto the fabric and look up a few of the classic stitches. Have a look at the contemporary work of Sarah K Benning to really inspire you. I love this little piece of hand embroidery I found on Etsy. It would be easy to do with a simple silhouette stencil and 2 different colours of denim. The bright yellow stitching really makes it. Denim and lace is trending at the moment and is a really great casual summery look. There are loads of pieces of appliqué of lace that you can add on yourself. White for sweet and black for vampy!! Macculloch Wallis do some some great appliqués and embellishments like the one below. You don’t need many to give your jacket a new lease of life. Adding studs is a great way to update your denim. Josyrose do some sew on versions and these gunmetal claw studs you can just press on and bend the claw on – takes about 1 minute!! Gap did a great range of metallic denim last Autumn. Have a go at doing your own – the hand painted brush strokes just add to the effect. Have a look at these amazing stencilled ones I saw on Etsy. They could be easily achieved with a stencil and a pot of gold fabric paint from Dylon. For a retro look go for embroidered patches – very reminiscent of the 1970s! There are some fabulous Day of the Dead style patches by artist Sunny Buick. Or if the hippie /rocker look is not your style and you’d like a slightly sweeter feel, try these pretty Liberty print patches. With denim it’s all about age. You can achieve instant fray and a natural worn look with sandpaper – sand lightly for a soft worn look and more strongly for authentic frayed holes. Sand areas that would become naturally worn such as the knees, the bum and the hems. There are so many ways of revving up a tired denim jacket. Adding special details like chains as epaulettes or embroidery or special buttons is the a great way to personalise your look. And for a glam look you can embellish it with iron-on diamanté applications or jewelled buttons. There are some AMAZING epaulettes on this site here – www.handembroidery.co.uk – but they are not cheap. You could have a go at making your own with braid and fringing. There is a great tutorial here on instructables on how to do it. Give your jeans a whole new look with tie-dying which is making a big comeback. It’s really easy. Throw them in the washing machine with Dylon or bleach and some string – have a look at this post from here is now for how to achieve the look. For a more drastic revamp you can change the whole shape of your garment. These scalloped edged shorts are a great way to reuse old jeans when the knees have gone. Have a look on my Pinterest page for a whole range of ideas to do with scallops. For those of you who haven’t seen it already, here is a pic from a previous post of my denim apron made from a pair of old jeans. Have a look at the full post here. And another post for this upcycled bag that I made for my tweenage daughter – a combination of an old pair of jeans, come crazy lining fabric and some iron-on transfers to personalise it with her name. Have a look at my Pinterest board – there are so many ideas. I haven’t even touched on the home furnishing side yet. I think that will have to be my next post! 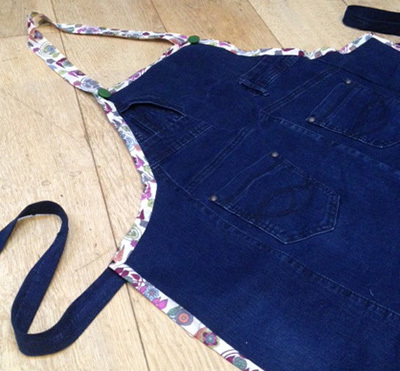 Follow Sew Different – Free Patterns’s board Customised denim on Pinterest. Love ❤ your ideas of denim!! My favorite fabric! !